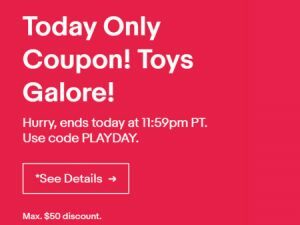 eBay is holding a flash sale on toys. 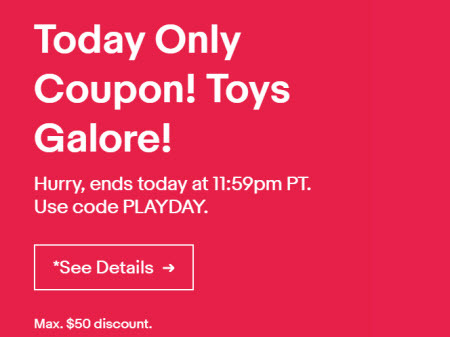 Shoppers can use the coupon code PLAYDAY to receive 10% off – toys only. The sale kicked off today at 6 am PT and runs the rest of the day (November 29, 2018). See full terms and conditions for details and restrictions. eBay blames confusion on sites that publish such promotions, but it’s clearly an issue it needs to address, as it leads to a poor buyer experience. Good on etsy. Owning your mistakes is a good sign. I am completely grinched out by ebays general behaviour this year. Sorry. Not even going to look, search has been so frusterating and hiding all the good stuff til after I pay. Last year this time Id be all excited.